One of the new amazing strollers that I saw at the ABC Kids Expo was Austlen Entourage. It has a unique extendable frame that allows you to carry a LOT of stuff. And, by a lot I mean groceries, suitcases, laundry, beach balls, beach chairs with umbrellas and noodles, large cooler and so on. You get the picture. That’s not all. It also converts into a double stroller with the addition of a second seat, infant car seat, platform rider, or a sit-n-stand! The durable frame can handle up to 150 lbs combined weight. What other stroller can do that? Amazing! This is a perfect model for busy parents who have multiple kids and always need to carry a lot of stuff with them. Another unique features of this buggy is the ability to put a second infant car seat right next to the handle bar much higher on the frame than on any other stroller I’ve seen. This brings your baby as close to you as possible promoting interaction and eye contact. And, as you know better bonding is very important at this age. This stroller really grows with your family. You can use it in a single mode as a travel system with an infant car seat, or a double mode with two infant car seats, or an infant car seat and a main seat, or with two seats, or with main seat and a sit-n-stand, or in a single mode with a rider platform in the back. It will work for twins or a toddler and a newborn. You will be also happy to know that this buggy has over 30 different configurations. Another thing I really like is a huge basket that you can use no matter how many seats you have. It’s very easy to access from the back or the sides and it can hold up to 65 lbs! This stroller also comes with an extendable tote that stretches with the stroller. You can pile up to 35 lbs into it along. With so many features, I expected to see a complicated and bulky fold, but it turned out to be very easy and compact. Of course the fold is not as compact as on your lightweight stroller, but I am comparing this model to other convertible strollers like Uppababy Vista, Britax B-Ready and City Select. The ability to fold with both seats attached makes it quick and easy process. This buggy weighs 30 lbs in a single mode (official info), and probably around 37 lbs in a double mode (no info on the weight of the second seat). I gave it 5 out of 5 stars because I’ve been really impressed by the design and so many amazing features. The reviews from parents have also been great. Of course it takes some time to test the quality, but so far so good. This buggy is available in two different colors and retails for around $849 (free shipping). -Large canopy. The large two-panel canopy with a pop-out sunvisor doesn’t go all the way to the bumper bar, but provides a good sun protection. I would like for the sunvisor or the panels to be a little larger, so that it would offer protection for the evening/early morning sun too. There is a medium size dark mesh peekaboo window with magnetic closure. -Adjustable handle bar. The handle bar goes from 36″ all the way up to 43″ from the ground. The soft leather cover reminds me of the steering wheel of my car. Very lux! -Extendable frame. The frame design is very unique and clever. It has three different linear stages that you can switch between as you go. Extending the frame will allow you to carry extra-large items using the lower frame and the basket while you can also fit a lot of smaller items using extendable market tote. The durable frame made out of anodized aluminum can handle a combined weight (including kids) up to 150 lbs! No other stroller has such a high weight limit. You can pile up the kids and then add a few suite cases. Amazing! -Adjustable market tote. INCLUDED! The market tote is a very interesting accessory that I haven’t seen on any other strollers. It expends with stroller and can carry up to 35 lbs. Great for shopping! This tote looks like a filing folder, but you can fit a lot of stuff in it. The first section has a cover and is like a regular parent organizer. Here is how it looks after expending the other two sections. There is no cover for them. -Roomy seat. The seat if very roomy. It’s 12.5″ wide with 18″ seat back and a measurement of 26″ from the back of the seat to the top of the canopy. While I like the canopy height, but I wish the seat back was a little taller (like 20″). It has one-hand lever recline. The recline is very deep and can accommodate a child from birth and up to 50 lbs. Great for long naps and quick diaper changes. BTW, the seat is NOT reversible. There also a nice mesh in the back of the seat for better air circulation. There also a nice mesh in the back of the seat for better air circulation and it has a closure. -5 point harness. It has an adjustable padded 5 point harness with center release buckle that you need to use both hands to unlock. Your toddler won’t be able to escape! -Second seat option. You can convert Entourage into a double stroller by adding a jump seat in the back. Now, it has only one configuration where the child in the jump seat is facing you while the child in the main seat is facing forward. The second seat is a little smaller, but still has a good size canopy and a 3-position recline. The recline is deep, but it does not include a flat position like the main seat. It can accommodate a child from 6 months and up to 35 lbs. The cool thing about the second seat is that you can fold it when not needed without taking it off the stroller and then decrease the length of the frame. And when both kids want to take a nap, you can extend the stroller and fully recline both seats. Amazing! -Travel system option. You can also have two car seats on this stroller. It can be just like a regular travel system when an infant car seat goes on top of the main seat, or you can add a car seat instead of your tote bring your newborn baby very close to you. I think this is the closest position for an infant car seat I have EVER seen on a stroller. When my daughter was a newborn, I was absolutely obsessed with her. I wanted to see what she is doing all the time, and catch every smile on her face. 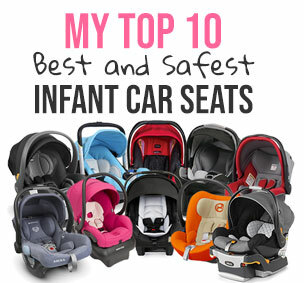 While there is no information on Austlen site about car seat options, I was told at the ABC Kids Expo that it should work with the most popular luxury brands like Nuna , Max-Cozi, and Cybex. -Sit-N-Stand option. You can also get a Sit-N-Stand kit turning this model into a double stroller. The seat can be easily folded when not needed. Your child can also just use the rider platform. -Over 30 different configurations. This stroller has many configurations because of the multiple seat/car seat combinations and 3-stage expansion. Keep in mind, the front seat is not reversible. Also, the second seat has only parent facing mode. That being said, most of these configurations are counted because of the frame expansion. -Swing-away bumper bar. INCLUDED! The removable swing-away bumper bar is covered with nice leather. -Adjustable leg rest. The leg rest has two positions: up and down. -Bassinet-like environment. Another interesting feature of this model is a hidden so-called-boot that you can use to create a bassinet like environment for your baby. This boot is hidden in the pocket underneath the leg rest. BTW, so far I did not hear anything about a bassinet option for this model. -Wheels. It roll on four EVA never-flat foam filled wheels with front swivel wheels that can be locked straight for rougher terrain. The rear wheels are 10.5″ while the front wheels are 7.5″. While this stroller can handle some rough terrains, it’s not an-all terrain stroller. But the wheels are a good size for everyday use like going to the park, running errands, or long walks around neighborhood. -All-wheel suspension. It has ball bearings in the wheels and all-wheel suspension. This provides great maneuverability and easy on-hand navigation. -Flip-flop-friendly brakes. The brakes are located between rear wheels and are flip-flop-friendly. -Huge basket. The Entourage is all about storage. It has one of the largest basket on the market. The basket is very easy to access and can handle up to 65 lbs. That’s a lot of weight! -Easy fold. With so many features I was expecting for the fold to be very bulky and complicated. I was wrong! The fold is super easy and very compact for such big stroller. You can also fold it with the second seat attached! Easy! There is an automatic lock and it has a standing fold. You can also wheel it behind you like a luggage. -Heavy. Just like most of the convertible strollers it’s pretty heavy at 30 lbs in single mode and 37 lbs in double. -Bulky. While it is as compact as this type of the stroller could be, it’s still a big package. The Entourage will be available in two colors: blue and black. The blue comes with a silver frame while black comes with a black frame. My favorite place to buy strollers and a lot of other baby items is Amazon. It usually has the lowest prices, free shipping, free returns and no sales tax. How great is that? You can get Austlen Entourage in one of the two beautiful colors for around $849 (free shipping and free returns). And, it comes with a bumper bar and a market tote. I love the idea of this stroller! I am wondering if it declines with both children, is the height of the seat up enough for a taller child and comfort level for the children. I currently have a nine month old and another due on the fourth of July, I want something both my girls will love and be able to grow up with and last. We are a very active family and love to go on trails and walking in the parks, is it acceptable for trails or just pavement? I have tons more questions and would love more information on how it does with outdoors compared to normal pavement. OMG I love this stroller! I want this so bad but I live in Canada and they wont ship to us =( Please let me know if there is any way I can get one, I don’t mind paying the shipping fees this is everything I have ever wanted in a stroller especially because I have two boys now, they are 3 and 1. Hello! I’m really interested in getting this stroller as it sounds crazy and advanced! But I need to get a stroller to start with my baby twins and I read that the second seat takes babies from 6 months and above so basically it won’t work for newborn twins right?? I’m really excited to actually get my hands on this stroller as it seems amazing and advanced. But then I read that you mentioned the second seat is fit for 6 months and above.. so basically- it won’t work out for newborn twins yeah? Hi can you run or go jogging with this stroller? I absolutely love this stroller! It is so easy to fold and unfold and not too heavy. I returned a different brand due to it being so confusing to put together. The Austlen is simple and just beautiful. Love it!